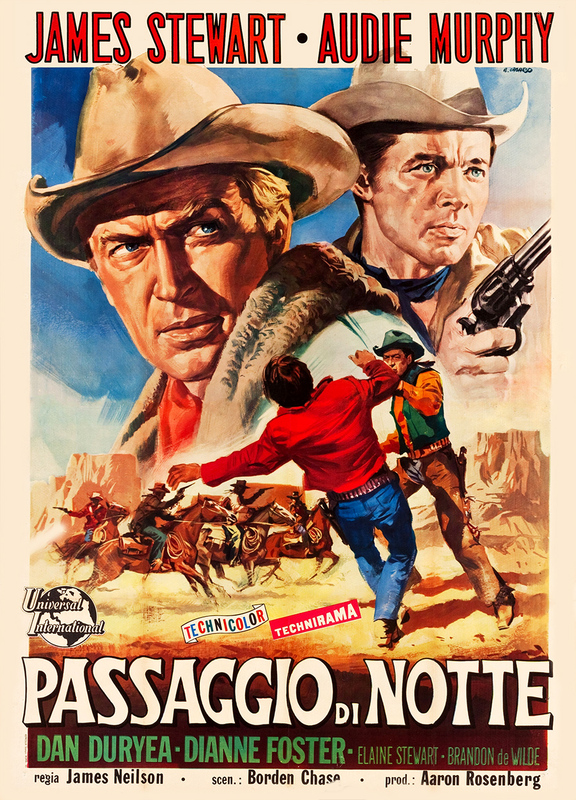 This is the movie that broke up the Anthony Mann-James Stewart partnership. 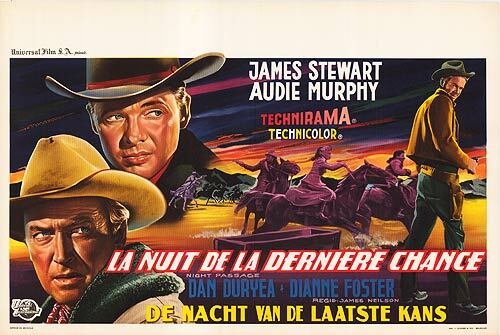 Beginning in 1950 director Mann and leading man Stewart had revitalized both westerns generally and Stewart’s career specifically with five westerns: Winchester ’73, Bend of the River, The Naked Spur, The Far Country and The Man from Laramie. 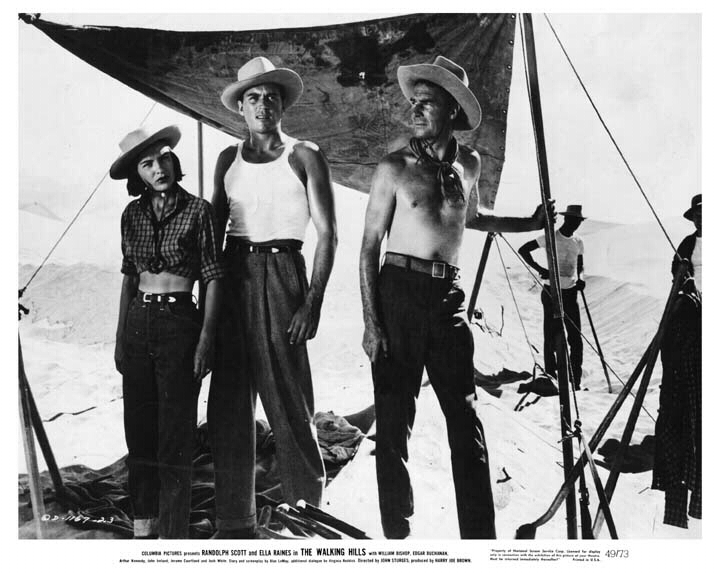 (They had also made three non-westerns together.) Mann and Stewart had planned to work together on this one, although neither thought the script was strong enough. Mann also thought Stewart and Audie Murphy were too different to be believable as brothers, he didn’t think much of Murphy’s acting skills generally, and he was not fond of the continual emphasis on Stewart’s accordion. Stewart liked the idea of being able to show off his accordion skills (although all his accordion-playing in the film was later dubbed in by a more expert musician). So Mann left the production to go make The Tin Star, Stewart stayed, and the two never worked together again. At the start of the film, Grant McLaine (James Stewart) is scraping by playing his accordion for change. He had once been a troubleshooter for the railroad but had been fired when he let an outlaw escape. Now Kimball (Jay C. Flippen), the railroad’s boss and the older husband of McLaine’s former flame Verna (Elaine Stewart), reluctantly hires McLaine back for one job: to get a $10,000 payroll through to the end of the line, despite Whitey Harbin’s gang. Verna makes it clear she wouldn’t mind resuming their relationship, and McLaine encounters Charlie (Dianne Foster), whom he had known as the long-time girlfriend of the Utica Kid. 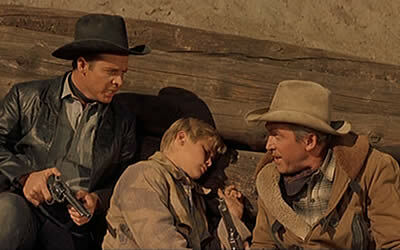 And he rescues Joey, a kid (Brandon De Wilde) being tormented by Concho (Robert J. Wilke). 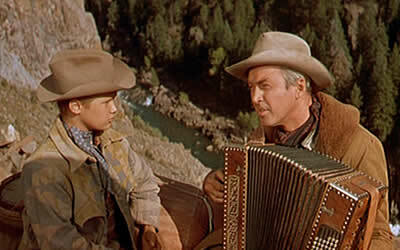 Grant McLaine (James Stewart) demonstrates his prowess with the accordion to Joey (Brandon De Wilde). True to recent form, Whitey Harbin (Dan Duryea) and his gang, including the Utica Kid (Audie Murphy), rob the train. Frustrated at not finding the payroll, they take Kimball’s wife Verna for ransom. McLaine and his accordion show up at the abandoned mining camp where Harbin’s gang holes up, and it develops that McLaine and the Utica Kid are brothers. The Utica Kid (real name: Lee McLaine) was the outlaw Grant McLaine let go five years previously, ruining his career with the railroad. Charlie arrives, too, and McLaine shoots it out with Concho, precipitating a fight with the whole gang. In the course of the extended gun battle, McLaine sends Verna and the payroll in an ore cart to safety. As he and Charlie trade shots with the gang, the Utica Kid reluctantly joins them. (In general he finds McLaine’s attempts to reform him tiresome.) But we know what traditionally happens to men with conflicted loyalties (see Randolph Scott in Western Union and Robert Preston in Union Pacific, to cite just two examples from railroading/technological westerns). Utica takes a slug from Whitey, but McLaine gets Whitey. In the end, McLaine heads off with Charlie, although they both would seem to need a longer mourning period for the Utica Kid before getting on with any relationship. 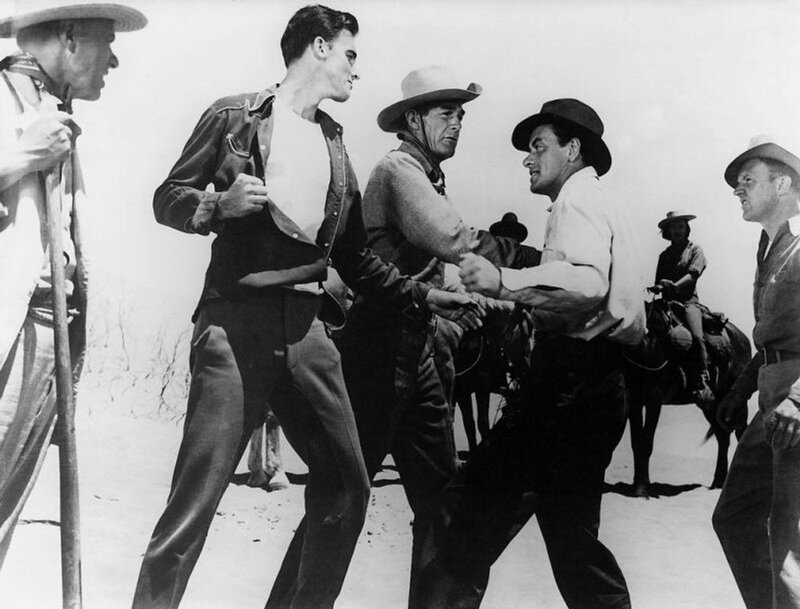 Finally on the same side, the Utica Kid (Audie Murphy) and McLaine (James Stewart) shoot it out with Whitey Harbin and his gang. So was Anthony Mann right? The script is muddled and less than clear, the cast is talented but overlarge, Stewart (six feet three inches tall, 48 years old) and Murphy (five feet five inches tall, 31 years old) don’t seem much like brothers, and the accordion quickly becomes tiresome. On the other hand, Murphy does fairly well in his role. There is interesting interplay between Whitey (thoroughly bad) and the Utica Kid (some bad and some not so bad), who are obviously going to have it out at some point. 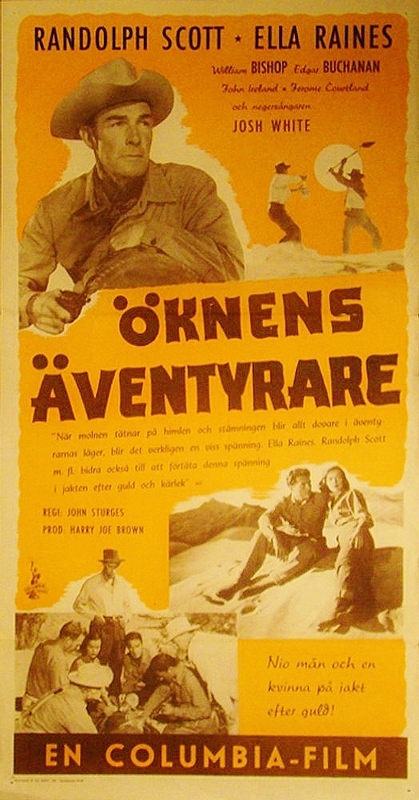 The movie was not well-received by critics or at the box office, Stewart seemed to blame Mann, and the two never spoke again. 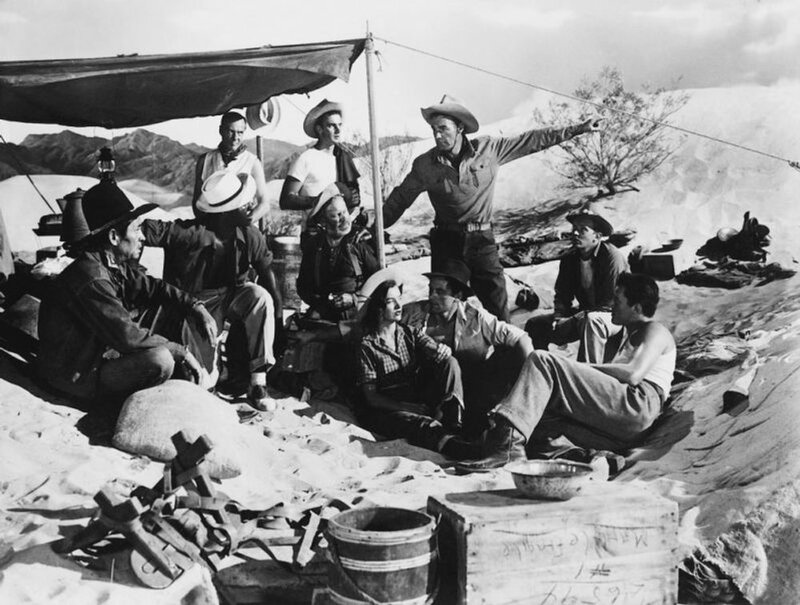 Stewart didn’t agree to another western for four years, until he did Two Rode Together with director John Ford (not one of Ford’s best). Dan Duryea, doing a humorless variation on his Waco Johnny Dean role from Winchester ’73, seems louder, more irritating and generally less successful here. The two female roles are undistinguished, both in the writing and as executed on screen; Charlie, particularly, needed more. There is a lot of talent involved here, but it doesn’t come together well. It’s not really terrible, but not very good, either. It probably would have benefited from an extensive script re-write, ditching the accordion and keeping Mann. Mann said later, “The story was so incoherent that I said the audience wouldn’t understand any of it. But Jimmy was very set on that film. He had to play the accordion and do a bunch of stunts that actors adore. He didn’t care about the script whatever and I abandoned the production. The picture was a total failure and Jimmy has always held it against me.” Obviously, a clash of egos was involved, as often happens in movie-making. 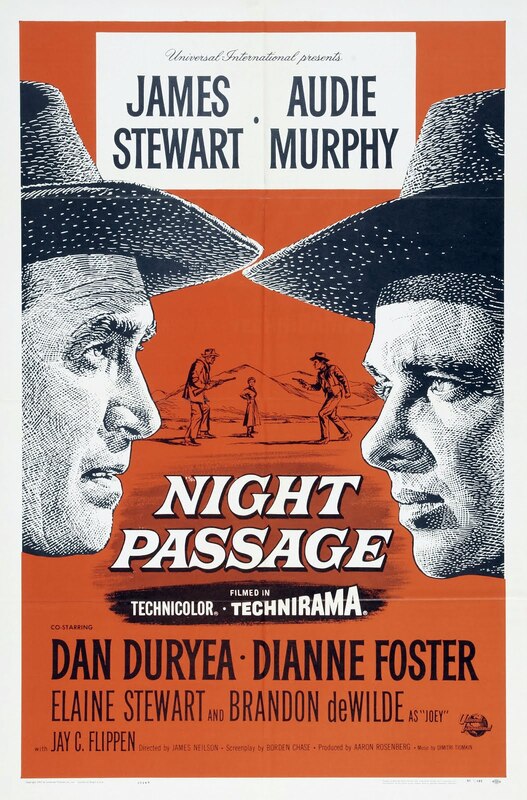 Night Passage was perhaps not so total a failure as that, but Mann’s instincts were mostly right this time. 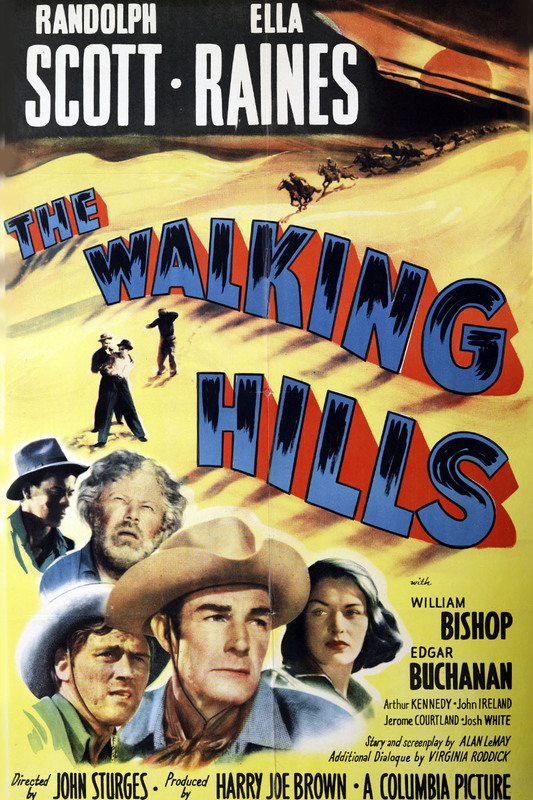 Shot in color near Silverton, Colorado, at 90 minutes; it was the first film made using the Technirama process. The compact running time doesn’t really allow for enough development of the numerous characters, which may be one reason the women don’t seem all that interesting. The cinematography by William H. Daniels is excellent. 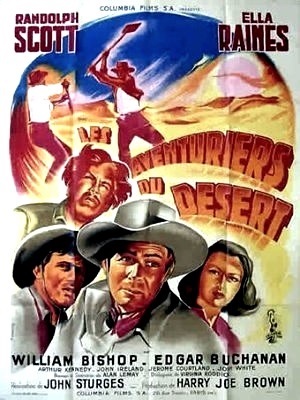 The screenplay is by veteran screen writer Borden Chase (Red River, Winchester ’73, Bend of the River, The Far Country, Vera Cruz), and music is by Dimitri Tiomkin (too many westerns and other films to list, including several with John Wayne). Director James Neilson was working mostly in television at the time and had a less-than-distinguished record in movies over his career. This entry was posted in More Westerns and tagged Audie Murphy, James Stewart, Train Robbing, Trains on January 16, 2016 by Nicholas Chennault. In 1870, widower Zachary Hallock (Joel McCrea) and his young son Joshua (Jimmy Hunt) come to the town of Timberline, looking for a new start. They buy a ranch at a good price and set about fixing it up, making friends with the Skaggs family, especially marriageable daughter Sarah Jean (Barbara Hale) and her young brother Daniel. As their first harvest comes in, they buy a couple of riding horses from amiable horse trader George Hadley (Charles Drake) for a wagon load of grain. Zachary and Sarah Jean are married, and she moves in. Timberline is also plagued by a band of outlaws. As Joshua is delivering the grain to Hadley, shots from ambush spook his horse and the grain is dumped into a creek and lost. The slippery-seeming Varden brothers (Alex Nicol and James Arness) approach Zachary with an invitation to join them in a robbery. They refer to a shadowy big boss, who gives them the information on which their robberies are planned. It works out profitably enough, but Sarah Jean and Joshua wonder about Zachary’s unexplained absences on more jobs. As Joshua follows Zachary, he is spotted by one of the Vardens (James Arness), who traps Joshua by the river until Varden slips, falls in and is drowned. 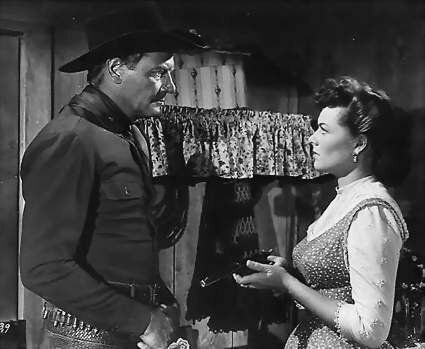 Sarah Jean (Barbara Hale) thinks new husband Zachary (Joel McCrea) has been less than forthcoming. Zachary is to bring the mules up for a final big score (robbery of a mule train of gold), where he meets the big boss: George Hadley, the horse trader and head of the local regulators. As Zachary is captured, he is rescued, and the robbery is thwarted by the Timberline regulators, alerted by Sarah Jean. It turns out that Zachary was a Pinkerton agent and was undercover with the gang until he could identify the real leader. And now he, Sarah Jean and Joshua can live happily ever after. 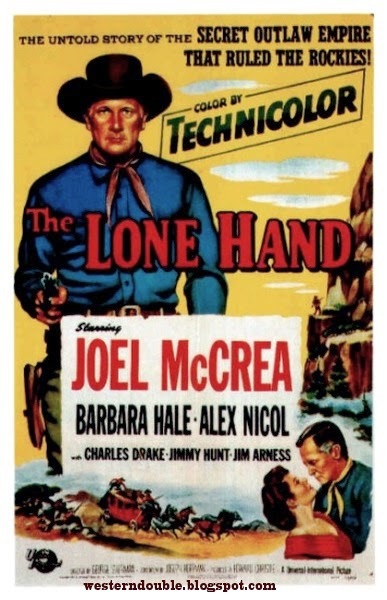 Among Joel McCrea westerns of the early 1950s, this obscure one is not one of the most effective. It depends on a gimmick, with the movie being mostly narrated by Joshua from a position of partial ignorance. Although the movie is not long (just 80 minutes), the gimmick is worn out before it is done. Barbara Hale is competent and pleasant to look at, but not terribly charismatic. (See her also as Randolph Scott’s fiancée in 7th Cavalry.) Alex Nicol, who plays the surviving Varden brother, is a better and more interesting bad guy in both Dawn at Socorro and The Man From Laramie. The river into which James Arness falls to his death is the same one (the Las Animas) used to good effect in Butch Cassidy and the Sundance Kid. Charles Drake is so smooth and amiable as George Hadley that we know he must be the leader of the outlaws, so that development isn’t really much of a surprise. 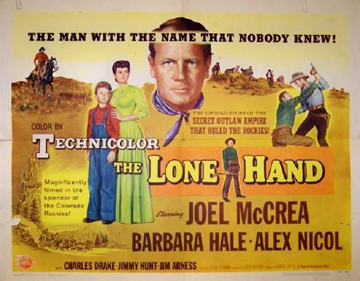 If you are a particular fan of Joel McCrea (and I am), you may want to see this for the sake of completeness. Although it’s pleasant enough fare, it may not be worth seeking out otherwise. 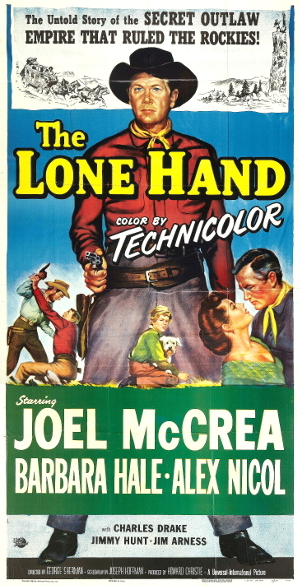 For other McCrea westerns from this period particularly featuring him in a parental role, see Saddle Tramp and Cattle Drive. George Sherman was a journeyman director who moved more into television work in the later 1950s and 1960s. He made quite a few westerns of which his best may be a late one: Big Jake (1971) with John Wayne. Story is by Irving Ravetch. Shot in color around Durango and Moses Lake, Colorado, with good cinematography and excellent scenery. Cinematography is by Maury Gertsman and music by Joseph Gershenson and Henry Mancini (uncredited). This entry was posted in More Westerns and tagged Joel McCrea, Outlaw Gangs on January 9, 2016 by Nicholas Chennault.